63,500,000. That's the number of Wii Remotes Nintendo says it has sold in the United States since the Wii launched in November 2006. How did Nintendo manage to move so many of the damn things? 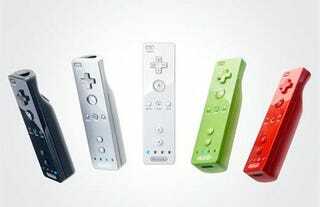 Wii Play was a big help, responsible for nearly 13 million Wii Remotes being snapped up by U.S. consumers. Wii Remotes included with the console were the biggest driver, logically, with more than 30 million Wiis now in U.S. homes. Nintendo breaks it down, like so, also proving that pink Wii Remotes are more beloved than blue Wii Remotes. Nintendo brags that the sum total of all those remotes is enough for "every man, woman and child living in New York, Los Angeles, Chicago, Houston, Phoenix, Philadelphia, San Antonio, San Diego, Dallas, San Jose, Detroit and San Francisco, and [...] every resident of Florida, Ohio, Virginia and North Dakota." With the current U.S. population at over 310 million, that's ... a lot of Wii Remotes. We'll interpret this info blast from Nintendo as word that the company is well aware of competing motion control products from Sony and Microsoft arriving this fall; a sort of "Yeah? So?" type announcement. How many Wii Remotes do you own?